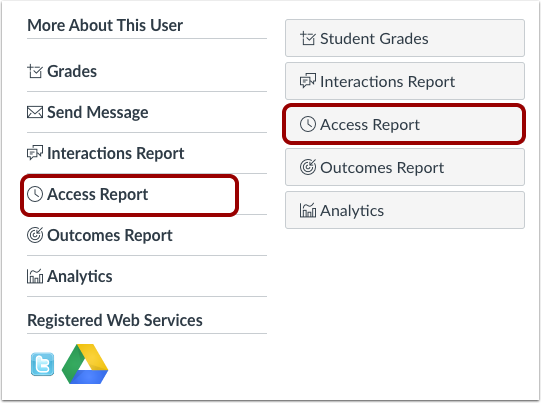 How do I view the course access report for an individual user? You can view the course access report for an individual user in the People section of your course. The course access report shows a summary of user participation in your course and complements the Total Activity column in the People page. You can view the full specific report for a student by viewing student analytics. You can also view your specific interactions with a student in the student interactions report. Note: The access report is part of a course permission. If you cannot see some of these columns in the report, you do not have access to view them. In the search field , search for the name of the user. 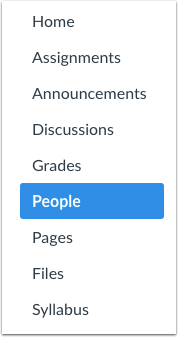 You can also filter users by role in the Roles drop-down menu . Click the user's Options icon , then select the User Details link . Locate the user details sidebar. Depending on the page display, click the Access Report link or button. The content the user has viewed . The number of times the user viewed the content . A view is counted each time a user navigates to the URL where the content resides or downloads an attachment. The number of times the user participated (if applicable, such as posting to a discussion or submitting an assignment) . The last time the user viewed the content . To return to the User Details page, click the Back to User Page button . Assignments : displays next to graded and ungraded assignments. Participation is counted if the user submits an assignment. Discussions : displays next to discussions and announcements. Participation is counted if a user posts a reply. If the user accesses content from an announcement, such as an assignment, the Access Report displays a Discussion icon. Quizzes : displays next to quizzes. Participation is counted if a user starts a quiz, even if they do not submit any answers. External Link : displays next to external links (LTI) such as Microsoft365 and Conferences. Participation is counted for external links such as Collaborations and Conferences, but is not counted when a user participates in Chat. Pages : displays next to content added as a page in the course. Participation is not recorded if a user views pages. Files : displays next to views or previews of course files.Participation is not recorded if a user views files. Note: The Access Report does not display a specific icon for groups. 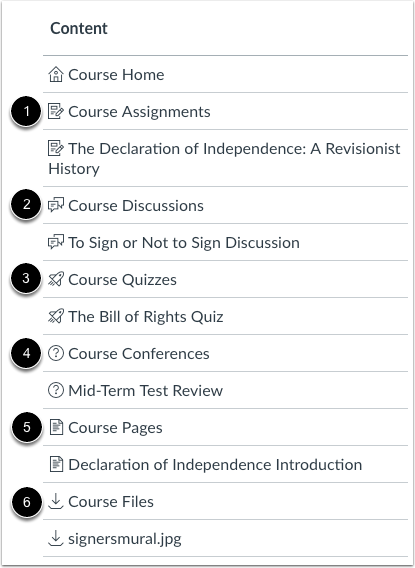 If a user accesses content from a group, such as a discussion or an assignment, the action is labeled with the appropriate content icon. Previous Topic:How do I view my course interactions with an individual student? Next Topic:How do I view registered services for all users in a course? 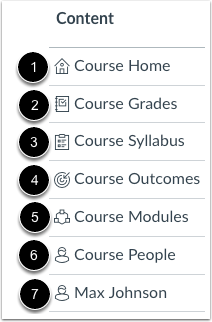 Table of Contents > People > How do I view the course access report for an individual user? Re: Analytics, Page Views, Weird! Re: View statistics on an item?